Known for his novel use of materials and his striking visuals, a major solo exhibition of Teppei Kaneuji’s work has opened in Yokohama. Teppei Kaneuji "Melting City, Empty Forest"
How do we visualize the building blocks of our world? Do we picture raw materials like sand, ore, trees or oil? Or do we construct from refined forms like bricks, girders, boards and plastics? In our industrialized world we construct things from already produced items. A world of surplus, of things unneeded, provides some artists like Teppei Kaneuji, with a mass of things ready for re-use. Born in Kyoto, Kaneuji graduated from Kyoto City University of the Arts. His work has been exhibited in group shows at the Mori Art Museum, Guangdong Museum of Art (Guangzhou) and the Museum of Contemporary Art Tokyo, with this first solo show in Yokohama sealing his status as rising star of Japanese contemporary art. Spread across two large galleries and a video room at the Yokohama Museum of Art is a collection of collage, photography, and sculpture, with copious use of plastic goods, resin, plaster and driftwood, some seventy per cent of which are works especially created for this exhibition. Kaneuji is known for his assemblages of commercially produced goods. Not exactly ‘found’ as in discarded refuse, but ‘found’ to have different possibilities of use. He states, “(t)hese objects originally existed with a different meaning. Using them was meaningful.” As we find out, beyond creating meaning simply through the act of ‘use,’ these works carry a strong ambiguity. These works dwell upon the interplay of relational forms rather than any nuance in the details. In the first large gallery, works from the “White Discharge”, “Built-up Objects”, “Outline” and “Splash and Flake” series are on display and a neutral blend of white and crème tones dominate the room. A single black line that resembles the coastline from a map runs the perimeter of the room, weaving into collages that hang on the walls. 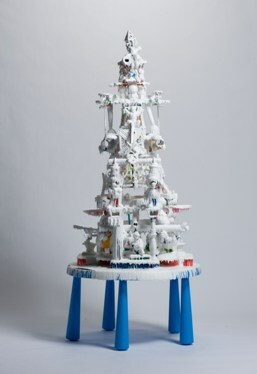 Throughout the space, “Built-up Objects”, a series of homemade symmetrical temple-like sculptures of plastic goods covered in white resin rest. Concealed by this melting plastic ‘snow’, the distinct colors of the constituent plastics goods – the colors that would otherwise break one piece from another – are neutralized. The 2D collage pieces of the “Outline” series similarly imply a kind of vaguely recognizable unity. With images taken from coloring books the segments are not complete on an individual level: the outline of a train or of an explosion blends into the lines of the adjacent cut-outs; the outline of mountains flow into waves, into hands, into construction equipment and so on. While Kaneuji’s poured-resin sculptures from “Built-up Objects” bear a likeness to the works of Petah Coyne’s wax-dead flower chandeliers, they differ in what they take as basic structures: Kaneuji’s could be described as architectural vs. Coyne’s beast-organism. 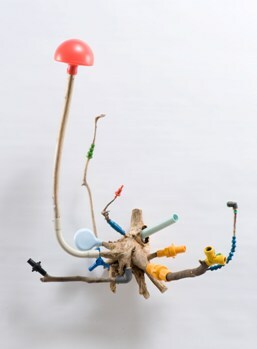 Coyne’s works incorporate biomatter covered in wax with forms like a giant black chrysalises or monstrous sea creatures. They both show us a ‘new life form’, however Coyne’s works seem firmly grounded in a biologic vocabulary, while Kaneuji’s comes from obscuring the relationship between biological and manufactured into a unified form. For example, the relationship between plastic doughnuts stacked upon doughnut-shaped brown, one fake makes the other cruder fake look relatively appetizing on first glance in ‘Muddy Stream from a Mug (Hot Cakes)’. Kaneuji’s works seem like formulae of creation wherein a decided group of relations are assembled. With this approach it does not matter if there is one completed work or ten works in the same fashion, it’s the underlying construction concept that provides structure. In the series “Splash and Flake”, we see bones and plastic wares arranged like the specimen table of an archeological site, or as a standing skeleton supplemented with plastic. There are five or six similar works presenting the same relationships over and over. In ‘Sea and Pus’, photographs are overlaid with cut-out images of goop, paste and creams. In ‘Muddy Stream from a Mug’, it is brown woods and plastics, real bits of nature and those imitating nature’s gestures. Coffee-stained paper blends with scraps of wooden dowel or plastic logs. One can think of Kaneuji’s work like the skeleton or relic of a society where the boundary between manufactured and natural things is blurred, and there resides a new intermeshed existence of flesh and plastic. Living beings and the products that support their life coexist and have fused or mated. While we might still conceptualize humanity as biological, natural beings, the reality of our existence is not purely natural anymore. Like the driftwood pieces of “Splash and Flake”, wood buds from plastic joints with a grotesque but strangely ‘natural’ integration. In the skeletons of the same series, small (plastic) bones perform similar roles alongside small plastic pieces of the total structure. The final effect of this is not a human form augmented with plastic but a new yet strangely familiar form. However, while Kaneuji says he creates “forms that people cannot control,” one wonders if he could not push his work out of these cycles of construction toward a more articulate and diverse examination of contemporary society.